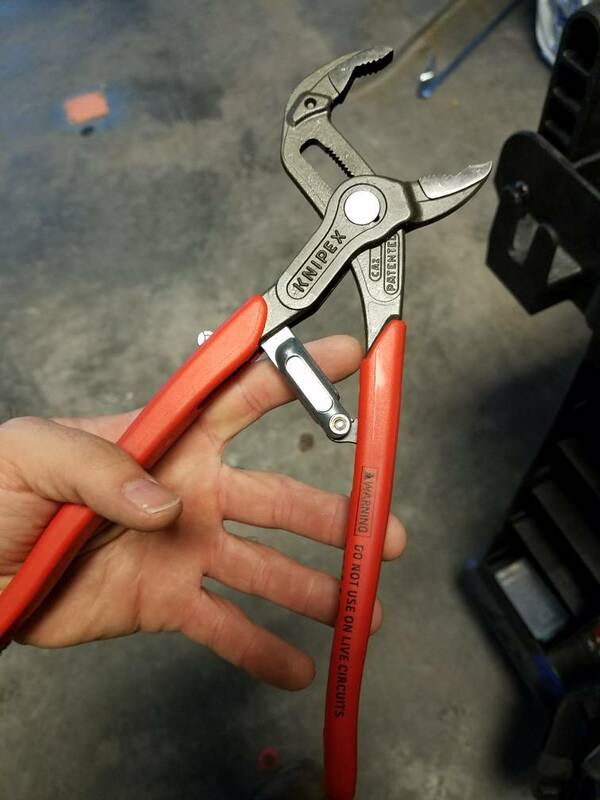 Knipex 10" channel locks... gotta be a joke. I've been using the same set of non-quick adjust 10" cobras for 30 years. They really are the best channys you can buy and I've tried all the major brands. I've been thinking about getting a new pair because mine are just now starting to lose the edges on the jaws. I just got them and wanted to show them off. I'm looking forward to using them tomorrow. I said they were $50 earlier, really closer to $60, but they'll make work much easier on this job. I didn't figure their capacity would be larger than the 10" cobras if you can see it in the comparison photo, but it was a pleasant surprise. I said something about using the same pair of Alligators for 10+ years on the HVACtalk forum. I was told that must be because I don't actually do any work with them. Idiots. Best pair of pump pliers I've ever owned. I am definitely going to look into these red button Knipex. I wanted something like the cheesy Robogrips for compression fittings. To me not having to fiddle with the pliers is better than any other feature, I don't really need a kung fu grip on the fitting. I have a set of the cheaper knipex, the ones with the groove adjustment not the button. I like the shape of the jaws but I never got them to do that automatic lock thing they show you in the videos. I like the box joint, and I like that they are light and narrow, and don't pinch you. However I do seem to get a better grip on pipe with Channellocks and Channellocks pricing is like half Knipex these days. I like the fatter handles of the Channellocks when squeezing as hard as possible. I have had more than one occasion where Channellocks on the pipe and knipex on the coupling, or vice versa, and the knipex was the first to slip. The handles on the knipex don't lend themselves to reaming pipe, that's a small advantage for the Channellocks. After a few real piss me off hand pinching incidents this last year I have been using the Knipex unless there's really a need for the grip power of the Channellocks. Since both are perfectly fine for 95% of tasks, I have been using the one that doesn't bite. The ones that the OP posted with the red button still need to be adjusted by hand, the only difference is that you don't have to press the button to close the jaws, only to open them. The model that TGGT posted is like the RoboGrip. Now I remember I looked at those but didn't buy them because they only made one size and they weren't big enough for 1" compression fittings. Did you see my photo? That's the jaws fully extended to 2". Though $120 for a pair is a bit much. I did not notice that ... can you get a good grip on 1" fittings with one hand? I can't see if the handles are too far apart. I don't care about a super strong grip installing compression fittings, just strong enough to get them reasonably tight, the main thing is a pliers that auto adjusts with one handed operation. I can easily operate them with one hand. I'll take pictures tomorrow. YouTube them, there's a video of a guy using them. For such a specific use, why not just use the RoboGrips? I have been using them. I hate them. The junkiness bugs me. They are laminated from sheet metal, weak as hell if you twist them. They are gigantic and clunky. They definitely fit 1” compression. Cobras are amazing. I had channellocks and never liked the slip joint on anything. Used the Irwins but they wear out too fast and are clunky. 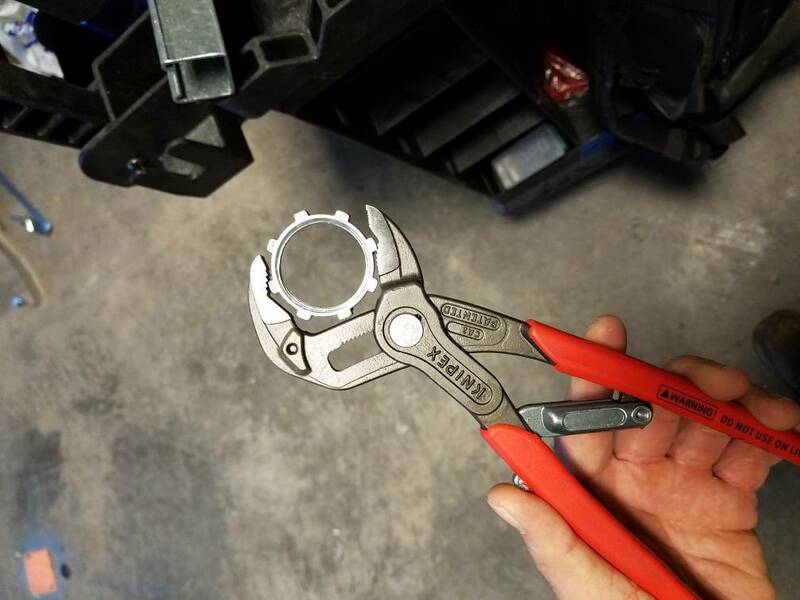 Knipex know what they're doing. I swapped to Knipex linemans, a whole set of Cobras from 5 inch to 12 inch, the cable shears, and the 7 inch pliers wrench. All of them have performed and never left me feeling I've paid too much. However, I prefer channellock e338 diagonals to the knipex variety, they seem to cut easier. If I got a bad set of anything I'd just warranty them. It happens. I feel pretty much the same way. Mostly preference but Knipex has never let me down and I prefer their combination pliers to more traditional NE nose linesmans. The only exception is that like you, I do not prefer their diagonal pliers. I had both 8 and 10 inch angled head models. I actually think their dipped grips are far superior to others in feel and adhesion to the metal handles. They just didn't fit my hand quite the way I wanted and the angle was just a bit different to the Kleins. This is one tool where I think Klein is the perfect example. Head size, angle, sharpness, etc. The D2000-48 with dipped grips are the best for me. No knock on the Channies or Knipex. Quality is great. Here's photos of a 1" locknut. I got small hands and its effortless to apply the locking pressure, in fact I accidentally deformed the locknut taking the picture. ****ADMIN**** I am the original poster on this thread, (woot) if an admin can send me a link to reset the password I would appreciate it. If that's not possible, or against forum rules, that's fine as well. Thanks anyway. Knipex sent me an email for a new design a few weeks back... intreasting. I cant seem to post the screen shot. But it Looks cool. I gotta run. Check in and try again at lunch. But I'm sure other guys got the same email that are more fluent on here then I am, if u could drop the pic, or link another thread if it's been addressed, that would be great. Admin will never see your post likely. Putting a '@' sign in front of a user name will flag the user that they have been mentioned in a post. Curiosity takes over. @Cricket < She will now see this and hopefully take care or your problem. MechanicalDVR and Cricket like this. I sent you a PM with my contact information. There is also a contact us link at the bottom of every page. Thanks, I emailed u back bud. I seem so lost on here with posting pics and notices I receive or dont receive. Have things changed or am I under some "newbie" posting restrictions or something?